All R.M. 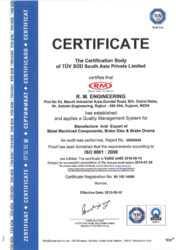 Engineering products are produced in its own foundry and manufacturing bases, under active and operative quality management system certified by TUV SUD South Asia Private Limited ISO 9001:2008. In acknowledgement of one stop lean productions from casting to finishing. We have a modern technology and also strict technical specification and complete quality procedure. In our company every single product is completely qualified by a standard instrument and equipment.